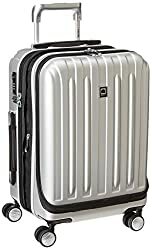 This article (Delsey Luggage Reviews) examines the best Delsey brand suitcases through editor recommendations and top picks. Whether you prefer a romantic European holiday with your significant other, a family vacation to a tropical resort, or a solo trip to an exotic destination, you need a good set of lightweight luggage that will last through those long flights. If you’ve had the same suitcase for the past 10 years, it’s probably time for an upgrade. When picking out new luggage, you need to determine which type of suitcase is best for your vacation preferences. If you mostly take solo trips or short trips around the country, you could probably survive with just a carry-on suitcase. If you tend to take long term vacations (think a month or more) or travel with a significant other, a large suitcase would fit your needs well. But if you mostly take family vacations with your spouse and children, a full luggage set is going to be the most economical. Once you’ve determined the type of luggage you need for your travel preferences, you need to choose a brand that is durable and will last for years to come. Delsey is a well-known luggage brand that has been around for roughly 70 years. Founded in France by Émile Delahaye and the Seynhaeve brothers, they combined their names to create the famous Delsey brand. Throughout the years, Delsey luggage has constantly evolved with innovative designs to keep up with today’s technology. Not only have they won over 50 awards in innovation, but they’ve created and launched the world’s first in-store luggage app. Delsey luggage is known for being reliable, innovative, and very lightweight for maximum convenience and ease while traveling. In order to ensure their suitcases maintain their shape and resist abrasion, Delsey puts every piece of luggage through a series strict quality tests. They even offer 2, 5, or 10 year warranties on every piece of luggage. Some even come with a lifetime warranty, so you know you are getting a high quality product with Delsey. Delsey has many luggage collections including their Aero, Titanium, Cruise, and Chȃtelet Hard + collections, plus many more. Each collection features a unique design and is made with a specific purpose in mind. Whether you are looking for a hard case, soft material, a suitcase with spinner wheels, or a piece of luggage that is particularly lightweight, you’ll find what you’re looking for at Delsey. You’ll find many unique features in the Delsey luggage collections that prove just how innovative their designs are. One of the more popular features you’ll find in some of their suitcases is the overweight indicator which lets you know if your bag weighs over 50 pounds. This gives you the chance to remove items at home, rather than try and stuff them into your carry-on at the airport. 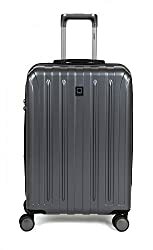 Most of their suitcases feature the double spinner wheels which allow for easy maneuverability and some even include brakes to prevent the bag from rolling away. If you get nervous about leaving your luggage unattended in a hotel room, you can opt for a bag that has TSA-approved locks built in right next to the handle. If you’re asking yourself, “Why Delsey?”, it’s because they create luggage that truly adapts to your travel needs. Not only are you getting a sleek design with interior compartments that make packing a breeze, but you’re also getting convenience, security, and durability all-in-one. By now you should be convinced that Delsey is the brand for you, so let’s take a look at the top-rated picks by category. The Helium Titanium Carry-On was made for the organized traveler. With its easy-access front pocket, you can zip through security by slipping your laptop in and out or use it to hold your tickets and passport. The zippered pockets inside the main compartment will keep your chargers, headphones, medications, or jewelry organized and easy to find. If packing gives you anxiety, this suitcase will make your life a little easier. The Chȃtelet Hard+ Carry-On is a suitcase made with design in mind. If you’re looking for a carry-on that is sleek and attractive, this is a great choice. It also comes with all the special features you need to make traveling a breeze and give you peace of mind. This particular suitcase is a bit on the more expensive side when comparing it to other Delsey carry-ons, but it’s design and reliability make it worth the value. The Helium Aero Carry-On is a great choice if you’re looking for a hassle-free suitcase. The four spinner wheels make for easy traveling because the bag takes on the weight as it rolls, not you. If you’re looking to buy souvenirs on your trip, the extra two inches and the organizational compartments will make packing simple and easy. All-in-all this is a fantastic carry-on suitcase for those who prefer comfort and ease when traveling. Overweight indicator that alerts you if your bag is over 50 lbs. The Cruise Lite suitcase is the perfect option for someone who travels frequently. 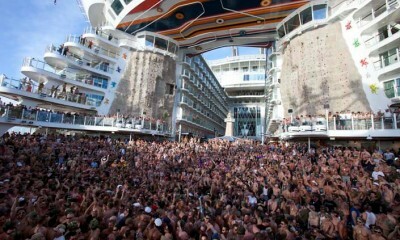 It’s extremely lightweight and easy to handle, which makes for a stress-free trip. The bag is very durable and will last for many long-haul flights to come. The interior organization was made with clever and useful pockets to ensure you can easily access anything you need without ruffling through all your nicely packed items. If you frequently take international flights or travel with a partner, this is the suitcase for you. The Helium Aero Medium sized suitcase is just the right size for the traveler who needs a little more packing room for their short trips. It’s larger than a carry-on but smaller than a large suitcase. The special features that come with this suitcase make traveling easy and comfortable. 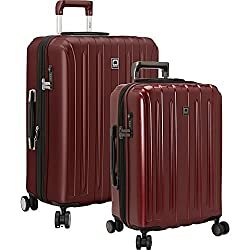 The Helium Aero is perfect for a week and a half long trip for one or a weekend trip for two and at an extremely affordable price this suitcase is a steal! The Helium Titanium is an all-around good suitcase. It’s lightweight and easy to maneuver with the 4 multi-directional spinner wheels. The expandable compartment and interior pockets make packing a simple and organized process. The built-in TSA-approved lock ensures the safety of your items while still being able to pass through security. If you decide to go with the Helium Titanium you’ll be getting a durable and reliable suitcase that will hold up for many years of vacations. The Aero three piece luggage set is great for large families or those who travel frequently at varying trip lengths. Traveling with three suitcases can be tough, but not with these. The 360 degree spinner wheels make shuffling through the airport simple and easy. The three bags nest inside each other for easy storage and include interior pockets for maximum organization. The set itself is expensive, but when compared to the price of buying all three pieces individually it’s a no-brainer. The Titanium two-piece luggage set is the perfect combination for a couple or a small family. Included is a carry-on and medium sized check bag, both of which come with all the features mentioned above. These are great for an international trip where you can keep important things in the carry-on that you may need in case of lost luggage. Or bring the empty carry-on and fill it with souvenirs at your holiday destination. The price alone is a reason to purchase this set. It’s extremely affordable and with the durability of the Delsey brand you know you’re getting your money’s worth. 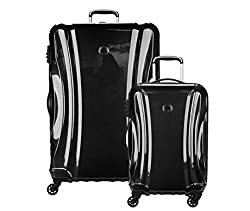 The Passenger Lite two piece luggage set is good for small families and couples. You can easily fit everything you need in the 29-inch large checked bag and save the carry-on for important items or souvenirs. The price is very affordable for two lightweight and reliable bags and is a great choice for those who like to over-pack for their trips. 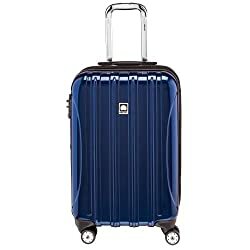 By now you should have a good idea of what kind of suitcase you need for your travel style and what suitcase features are most important to you. 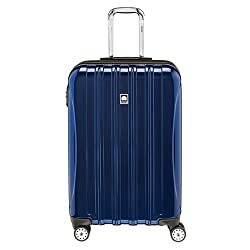 Although most Delsey bags offer similar features such as the spinner wheels and TSA-approved locks, they all have a unique design that cater to different needs. Whether you need ease of use and maneuverability, security and safety, or a sleek and attractive design, Delsey has something for everyone. When picking out a new suitcase, durability is a huge factor. You are making an investment with new luggage and you want it to last more than a few trips. Delsey is known for making durable and reliable luggage through their choice of materials and the series of “torture tests” they put them through. Whether you choose a soft material or hard case suitcase, you know you’re getting a bag that will last for many years. Airports and traveling can be hectic and stressful. With Delsey, your suitcase will be one less thing to worry about. The 360 degree silent spinner wheels makes for easy maneuverability and relieves your arm of the weight of the bag. Delsey is also known for making lightweight luggage that is easy to handle and lift into overhead bins or into the trunk of your car. If you own a Delsey bag, traveling just got a little bit easier. Delsey is so good at just making overall amazing luggage. They take everything into account from weight, to maneuverability, to design, to security. With their built-in locks and overweight indicators they’ve truly thought of everything. And with their mobile app you can track your bag to ensure it makes it home safely. Not only are you getting an attractive suitcase, but you’re getting one that works for you, not against you. Do Delsey bags come with a warranty? Yes, all bags come with either a 2-year, 5-year, 10-year, or lifetime warranty. These only apply to manufacturer defects, not normal wear and tear. Be sure to check what your warranty is before purchasing a particular suitcase. You can learn more about their warranty policies on their website. Does Delsey make anything other than suitcases? Delsey offers mainly suitcases but they do sell a few travel accessories and bag organizers. How does the built-in TSA-approved lock work? The lock works as a combination lock to keep your suitcase secure from hotel staff or anyone else that doesn’t work at an airport. TSA agents have a special key that they alone have access to and can use to open your lock if they need to check inside your bag. How should I care for my Delsey suitcase? For soft or hard cases, use soap and water with a soft cloth to remove dirt and dust. Vacuum the inside of any sand, dirt, or dust and store it in a cool dry place. You can read more tips on how to care for your Delsey luggage on their website. Now I want to get an entire set so that the rest of the family can use. Thinking about the Delsey Passenger Lite 2 Piece Hard case. It just looks so sleek and stylish. 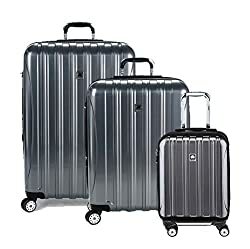 Has anyone used this luggage set and can provide a review? Julia is a corporate Account Manager turned Travel Writer. She spent 3 years in San Francisco as a Sales Rep for a tech startup before leaving the country to travel for a year on her own. She now owns the travel blog, The Freckled Tourist, and works as a Freelance Writer for various clients.